Google's Chrome web browser supports PWAs already; Google launched PWA support in desktop versions of Google Chrome in 2018 so that users of the Chrome browser may install these PWAs directly. The option to do so is hidden in Chrome's main menu and there is no indication currently whether a site or service is provided as a PWA or not in Chrome's main interface. While you could check manually each time by clicking on menu in Chrome to see if the "install" option is listed in the menu, it is not the most comfortable option. Google seems to agree. 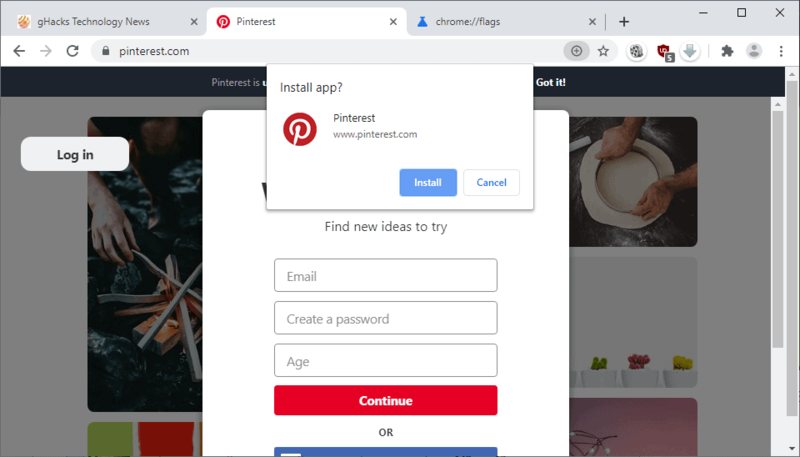 The company launched a new option in Chrome Canary, the cutting edge version of the browser, that indicates the existence of a Progressive Web Application in the Chrome UI. Load chrome://flags/#enable-desktop-pwas-omnibox-install in the Chrome address bar to get started. This focuses the right experiment on the Experiments page of the browser. Set the feature to Enabled. The flag, Desktop PWAs installable from the omnibox, is available in all desktop versions of the Chrome web browser. Chrome displays a plus-icon in the address bar when it discovers a PWA on a page. It may also show "install" on first load. A click on the icon displays the installation prompt to install the PWA in the web browser. You may cancel the installation but there is no option right now to disable the install indicator on select sites. The change improves the discoverability of PWAs in desktop versions of Google Chrome. The feature is experimental which means that it may land in Chrome Stable eventually, may be removed without warning, or may waste away as an experiment. I don’t use them either, because I haven’t figured out how (if it’s even possible) to use them in a way that I am comfortable with in terms of security. Peas are just websites with special features. They are actually more secure than normal websites as they must be https. But most importantly whether you “install” them or not does not matter in terms of security so you have likely used pwas anyway as many websites are already pwas. There is much more to security than using crypto. I’m concerned with being able to do things like set firewall rules for specific PWAs to prevent them from phoning home, etc. The problem with PWAs is that they’re websites, and use port 80 — as far as I can tell, that means that my firewall can’t distinguish PWA traffic from other browser traffic, which means I can’t (without engaging in deep packet inspection) set rules for specific PWAs. I can guarantee that I have not unknowingly used PWAs. Google turns desktop Chrome into a Chromebook ? One more thing to pop up & annoy you. Seems like web notifications but worse.